Manchester conurbations as a holiday destination. Many campsites opened along the coast including at Kinmel Bay. The line at Kinmel Bay had four tracks up slow and fast and down slow and fast. The station was only provided with two platforms which served the slow lines. traffic, opening on 4th July 1938 and closing on 2nd September 1938. It opened again the following summer on 19th June 1939 but closed on 2nd September 1939 and there was no further passenger service although the station didn't officially close until 9th October 1948. Kinmel Bay Halt didn't appear in public timetables. Nothing survives of the station today but the line remains busy. Kinmel Camp and Foryd Pier - A military line ran from Kinmel Camp to Foryd Station joining from the east so a reversal was need for journeys to Rhyl. The line was opened on 7th August 1916. 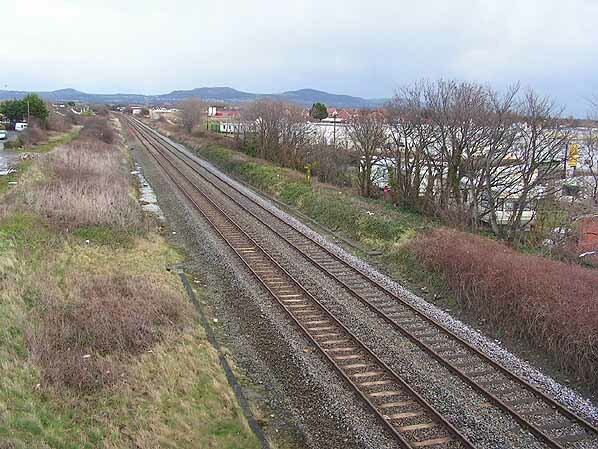 The line was later diverted to join the Denbigh line just before this joined the main line (see map); initially the link was along part of the line to the harbour requiring a double reversal. 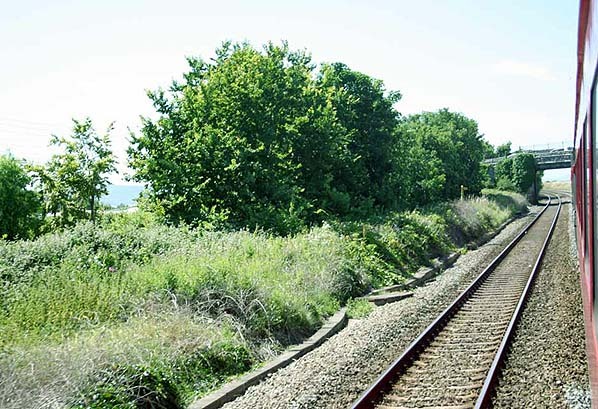 The new link opened on 14th June 1917 by GOC Western Command and trains were diverted over the new link from 2nd July 1917 with soldiers trains running to Rhyl and Foryd when it re-opened in 1919. Initially there were six daily trains to Rhyl and seven back for troops' recreation. The camp was dismantled in 1920. The line to Foryd Pier ran from the original Foryd Station, opening in August 1859 to connect with steamers to Liverpool. 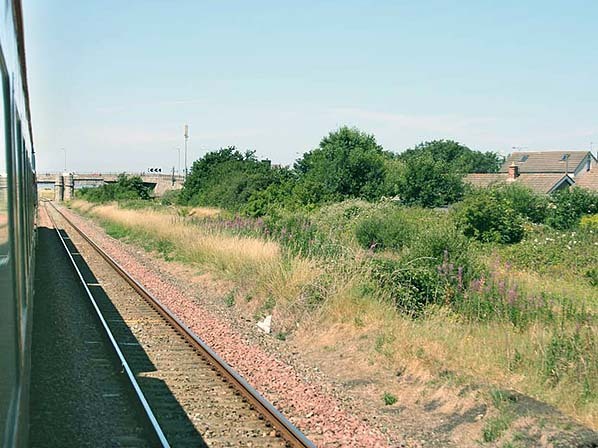 The station was resited nearer the river mouth on 1st October 1865. The untimetabled service wasn't regular and there is no record of when it ceased carrying passengers but it continued to carry freight until 6th April 1959..
Pictures of Foryd Station are very hard to find. This one is c. late 19th century. Site of Foryd westbound platform looking west. Note the same bridge as in the 1890's picture above. 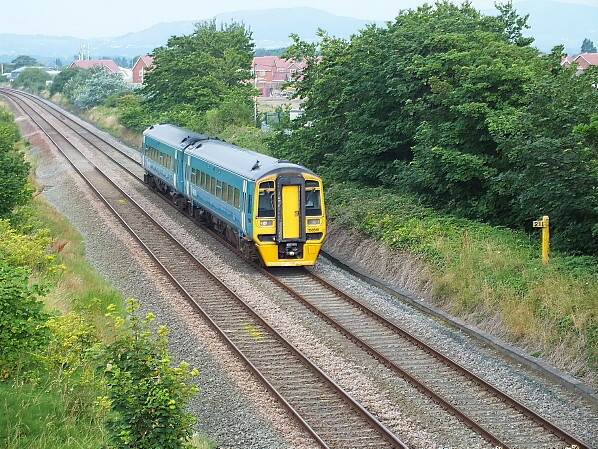 On Sunday 12 August 2012 a Cardiff Central - Holyhead service passes the site of Foryd Station, which is indicated on the yellow milepost as being 211 miles from London Euston.